A lovely and moist cake! I love almond extract. Kudos on the ingenuity - it looks great! What a fab looking cake! MMMMMM,....Happy Belated Birthday, Dear Grace! Your cake is lovely and I hope you had a great birthday, Grace. I've spent all weekend eating ice cream and bread yet when I saw your recipe all I could think was "where can I get my hands on some coconut pudding mix???". Looks delicious. Happy belated birthday, Grace! I'll have to go to the local international candy shop and get Mounds and Almond Joy so I can weigh into the debate in an informed way! But as Faith said, Bounty is brilliant. WOW! This has me hook, line and sinker! I love chocolate and coconut and, the Almond Joy. The Canadian version of Mounds would be Bounty and it arguably my favourite chocolate bar. I just love cococnut. i remember the jingle too, and i LOVE almond joy, still do. i love them so much i make my own since mine have more coconut in them and no chemicals. i vaguely remember bounty...what was that one? Happy belated birthday Grace! I don't like either candy bar (not a fan of coconut) but the work crew enjoys it. Will be bringing this in soon! Happy Belated Birthday, Grace! And I love how you took a cake mix and added all those goodies to it. (Sorry almonds were not available) I really think this cake looks divine! For some really odd reason, because I DO love all things coconut, I never liked Almond Joy or even Mounds. My taste went always to Milky Ways. Frozen. And I think I recently saw and saved a recipe made with Milky Way bars someplace. This reminded me. I hope I find it. It's wandering around in this computer someplace. Am I the only one this happens to? Hope you had a wonderful birthday! And that you enjoyed channeling your inner Sandra Lee. I still love almond joys--coconut and chocolate...just can't go wrong! The cake looks so moist, I love the coconut cream here. Hope you had a wonderful birthday! Cheers! To die for. . . This looks so rich and moist. Nice cake. Definitely saving this recipe Grace, you did fabulous and that cake looks amazing!!! P.S. Love the way you snuck that birthday sentence in; Happy Birthday!!! Happy belated B-day. Thank you for stopping by and the kind words. This cake looks sinful. I've enjoyied your blog immensely. Have a wonderful evening. Cheers! That's one moist, delicious, and fabulous looking cake! Nice work. I totally remember that jingle by the way...I was a kid of the 70s. Oh wow what a delicious cake! I love Mounds AND Almond Joy! Coconut and chocolate were meant to be together! I totally agree about the Almond Joy- I've often said they would be SO much better with chopped almonds sprinkled all over them!! I don't remember much tv from the 70's let alone the commercials. I do though remember my mom munching on Almond Joy bars. As a matter fact she'll ask for the ones the kids get after trick or treating. Happy Birthday! And I love the idea of an almond-less almond cake. I think it looks delish - semi-homemade or not. Gorgeous photos: the cake looks so moist. This looks wonderful! I definitely remember the jingle, but I definitely always felt like a nut (in all senses). I agree, though, that there was a more perfect integration of the almond, coconut and chocolate possible, and looks like you did it! I've never tried an Almond joy so I feel like I should try and seek one out now -nor have I heard the jingle-double shame! :P However I did start drooling at that picture! Your cake looks beautiful. Happy Birthday, Grace! LOL, Grace, you're definitely a NUT! I'm not sure what kind, though. Coco-NUT? Definitely NOT a pea-NUT, I'm thinkin'. In any case, NUT-in would be better than a hefty slice of this on my plate. I have to say, I don't really like nuts in my baked goods either. On top - yes. Mixed in - no. when they're mixed in they just obstruct my way to the fluffy goodness that is cake. This sounds delicious, semi-homemade and all. Love the coconut infusion. Great job on the fly! This cake looks great, with or without limited resources! I have a coconut cake in the wings to post sometime coming up! I have made this cake and it is really good! Your photo is just yummy looking. Sandra Lee ha, ha! I am LOVING the almond in this beautiful cake!!! It looks SOOOO moist and heavenly!! Cool wHip - you could put that on just about anything and I'll eat it. Love the stuff! The cake does look yummy! Yum! I love the coconut cream & flakes in this delicious cake! Happy belated birthday! Happy belated Birthday! The coconut cream on top is inspired. Great idea. I need to search again for coconut extract. I haven't been able to find it. Happy belated birthday! And there is nothing wrong with channeling a bit of Sandra Lee, girl knows how to make a good cocktail! I am an Almond Joy girl. Mounds dark chocolate was too rich for me. This cake on the other hand makes me drool - especially with the leftover coconut cream on top...mmmmm good! Hope you had a wonderful birthday. This cake would make anyone want to celebrate. I hope you had a good Easter-birthday! I use boxed cake mixes all the time--no judgement here. Though I do my pies from scratch. :) Priorities, people. I love both mounds and almond joy equally... happy birthday and that cake looks like you celebrated well - it looks both gorgeous and delicious. Hey - nothing wrong with a little bit of Semi Homemade! It looks delicious. This sounds so good! I agree with you, Mounds > Almond Joys! Almond flavor is always welcome in a cake! Grace, your cakes properly make me drool. I must have this very soon! Great improvisation. Sometimes a desperate cake lover has got to do what they've got to do. Almond extract is not so bad either. Cool idea, and glad you didn't become a full blown Sandra Lee. I don't like either one of those candy bars, but I sure think I could hunker down with a piece of this cake. Looks DElish! Happy belated birthday! That cake looks moist and delicious! Hey it's your birthday so go semi-homemade if you want too! I just adore almond extract, and I like both of those candy bars, too. Your cake is inspired! Happy belated birthday, Grace. Ooh what a super easy cake! Yeah the nuts need to be chopped up in the almond joy, I agree. Hope you had a great birthday! OMG, this cake sounds amazing! I LOVE Almond Joys/Mounds so I would totally devour this cake! Happy belated birthday girly! What a delicious cake to celebrate your Easter B-day! i love how we can use a cake mix..
and it'll taste completely different and awesome. hehe almond extract is awesome. my grandmother would only bake cakes with boxed cake mix and add to it. I've always thought that was a great idea to save time. yum! I love the mounds/almond joy twist to this cake! 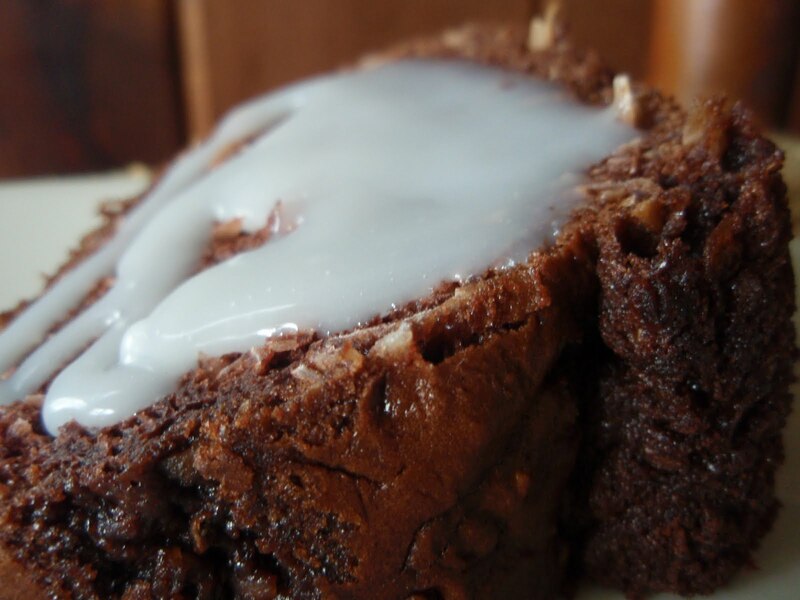 It looks so moist and gooey, which I love in a dessert. I've only ever had an Almond Joy (must change that!)... but this sounds amazing! This cake looks super yummy and moist and there is nothing wrong with using a little Semi-Homemade. Sandra Lee would be proud! This cake look sooo good. I love Almond Joy. I remember that jingle. :) I agree, sliced almonds would be better than the whole ones. 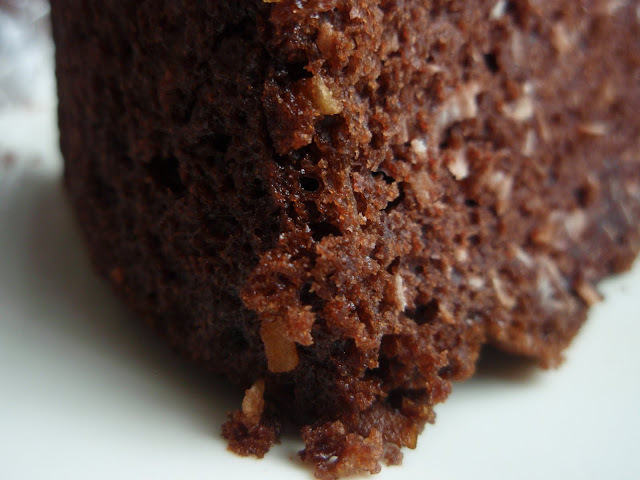 This cake looks pretty flawless though, reminds me of german chocolate, but better and more fun! Sorry I missed your birthday! So funny, though--my husband and I were just singing that jingle last week and annoying the kids. I can't even remember why we were! The cake? Looks divine--and I'd happily dig in. I can't get enough coconut. I loved that jingle as a kid but actually wasn't a huge fan of Almond Joy or Mounds. I was more a Snickers and Nutrageous fan. I hope you had a great birthday! That cake looks like a nice way to celebrate, especially with a drizzle of that coconut cream. Perfect flavour combo! So obviously we are a bit behind on commenting. Happy late (ok really late) birthday! That photo is making me hungry for cake. I like that it starts with cake mix. Anything that takes out a few steps is excellent in my book!